Alcohol is a thing that splits generations. And generations of Humans has drunken it. In my opinion it´s not bad. I don´t drink often, but sometimes. Only this mass of people, young people who drink so many, i don´t really understand. Most fun i have is when i´m sane. Not because i hate alcohol, because i fell everything an can remember it better. At parties or some events a little bit of alcohol is ok, but do someone really want to creep home because he has drunken that much? One time i had drunken too much and the end was not that happy that i want to do it again in my live. "Rhaegar fought valiantly, Rhaegar fought nobly, Rhaegar fought bravely. And Rhaegar died" - Jorah Mormont about Rhaegar Targaryen from A Storm of Swords. Combi made by the talented cutiesmartgurl! Nescio. Sed fieri sentio et excucior. >> I hate and i love. Why i do this, you maybe want to know. LocationBetween a rock and a hard place ? Maybe I should make this clear: I`m not saying "Don`t drink alcohol. Ever." That would be rather funny, given what I consume and in what intervals. But you should know how NOT to endanger others - and if you manage to not endanger your own dignity in ways we all know, that`s also good. Btw, when I was 14/15, I never thought I would smoke or drink alcohol other than on NYE....a lot of things change in 3 years....6 years.....10 years...... ...you`ll see. My father and mother never smoked or drank, so I learned that it is "wrong" to do so at a young age. I know what you mean, but I simply don't see it happening. To stay on topic, these kids (I guess children would be more appropriate) always talk about there father's liquor cabinet, and their "feelings" after getting drunk, and there next time they're going to get high. This is in my elective (that the school chose for me because the one I wanted was full). Get drunk is really a big problem all over the world not only in europe or US! cuz it's not healthy at all,all the doctors say that plus it's cause some killing disease! I'm 19 years old and have never had a sip of alcohol. MAYBE I'll have a glass of champagne or something on my 21st birthday. But seriously, I don't plan on having more than that. After I hit 21, it'll only be on very special occasions and in extreme moderation. I just don't think it's worth it. Alcohol brings so much bad to the world. All the mistakes, the punishment if you're underage and get caught, the humiliation, the vomiting, the drunk driving and ahem KILLING PEOPLE. Just not worth it AT ALL. I'm around alcohol constantly. I still party. I go out or stay in with friends who are drinking, and I've been pleasantly surprised at how easy it's been for me to continue to say "no" even in college. And people really respect that. I constantly get the question, "Not trying to be disrespectful, but just out of curiosity, why don't you drink?" And I explain to them my control issues-- I feel a need to be complete control of what I'm doing at all times. If I'm acting like a fool, alright, chill, I'll do that-- but it better be MY decision and not just because I'm in some altered state of mind thanks to some foreign substance. And then, as I said earlier, I just don't think it's worth it. Then they'll be shocked that I've never had even a sip and try to get me to just try it, and I explain how proud I am to be able to say that I've never had eeeeven a sip, and usually they understand. But I am around it constantly. Alcohol, weed, and cigarettes. Almost all of my friends do at least 2/3 of them on a regular basis. And they respect that I choose not to. I stopped drinking 365 days ago (jan 1) and I don't miss it. Congrats! I'm really proud of you for that! I know a few things about alcohol consumption, and what puzzles me most is how anyone who ever got SERIOUSLY drunk can do it again....considering all the unpleasant side-effects. And I really don`t get the point of drinking until you drop. Literally. Where`s the fun in that? I feel the same way. I've got far too many friends who have gotten blackout and vomit drunk who still enjoy doing it, and I don't understand. My best friend's motto these days is actually "Blackout or back out." What the hell kind of a motto is that? Apparently it's really "fun" to wake up and have to figure out what the hell happened last night. -.-' I wouldn't have fun with that. I enjoy actual memories. Well I know alcohol is a great problem, I lived without it until recently (used to be very anti) when I found that drinking a bit (there are different stages of drunk...) with your friends is really fun, you let loose on a different level and I could never go out and dance without alcohol I'm 20 btw. I find no problem with drinking.... what I do have a problem with is drinking to get drunk. Have a glass of wine at night.... don't go shot for shot with you friends. I am 19 and proud to say I have never been drunk! I must admit I do drink, and I have had more than I normally do during this Christmas/New Year break. Once the holiday is over though, I will most probably only have a few drinks at the weekend. I must admit, I do admire those of you who don't drink at all, or who only drink on special days, like Weddings and Birthdays. Not only are you looking after your health, but you are saving your money for other things. im amazed at how many people here dont drink. i would never say no to going for a pint at the pub, and i do drink a lot at parties. but i enjoy being drunk.. i always seem to have more fun. I'm amazed as well. This forum def seems to be in the minority. I wonder why that is? 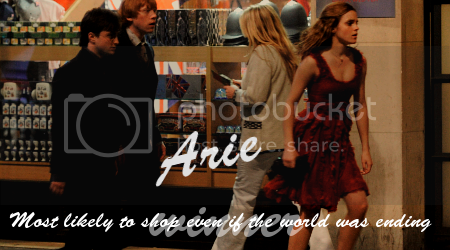 The majority of people who are potter fans? Emma fans? Internet forum-goers? Hmm. I don't drink either. I had a sip of champagne once, at my cousin's wedding but that's about it. My mom's an alcoholic so I've seen the negative consequences of that and so I've never really had an attitude for it. My dad, whom I've never met, is also an alcoholic so I know I have the genetics for it and I want to avoid it so I can be a good mother and parent later in my future. I don't really feel pressure to drink. All of the girls on my rugby team do and I don't go to the parties so it's a little hard for me to fit in with them there, but I don't mind too much. Daughter:Amber. Auntie: Sarah. Sisters: Prongs, Stefanie, and lindalumos. Brother: Ardi. Edited by ckravitz, 03 January 2011 - 04:42 AM. Congratulations on that. Actually sticking with a New Years resolution, that's new to me. haha, I promised it to someone actually, someone I care about a lot. Not that I was a heavy drinker in my life (20 now) but still. IMO, having a beer or glass of wine or whatever every once in a while is completely fine. No, actually a glas of red wine everyday (like said above) is healthy. You just have to know your limits (also said above). haha I get the same question as well. And some think my reason is stupid (the promise). And good for you by the way. The main reason why I stopped is because of the promise I made, and because of the party before new years (2009/10) when I couldn't remember what happened the next day. I never drank that much before, and I didn't drink so much that night tbh. I just screwed up. Edited by W.V.B, 03 January 2011 - 05:15 AM. @ Jade: I remember reading that on the old forum. Great to hear that you've not still in that situation. Ive had a girl asking me why I dont drink and telling me why its cool to drink. She said that it made it fun because it made stuff not funny, funny. Like a door knob. Why would I want to laugh at a door knob? And the stuff is so expensive! 3 times the price than what you would pay for the same quantity of coke or juice! @ yorkshire Im not anti drinking, Im anti drinking in excess. I have no problem with drinking in moderation like I said in my previous post. Mainly I hate that it alters the way your judge and function. I hate not having full control over my body and mind. Anything mind altering for me is a no no. The E-Family I forgot I had. To the bold: yes, exactly, same here. hahaaaa I don't need alcohol to think a doorknob is funny is the thing. Or any substance for that matter. I can act as silly and outgoing as I want. >.< But I want the ability to judge intelligently whether or not it's a good idea to do so!! Also, I don't do anything that I'm not willing to take responsibility for. And I do NOT want to take responsibility for either drinking underage or the stupid stuff I might do out of a drunken lapse in judgement. 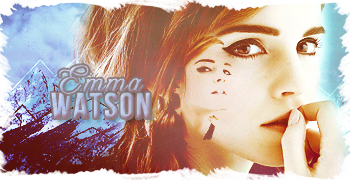 Edited by emwatsonsuperfan, 03 January 2011 - 08:24 AM. Its all what frame of mind your/Im in. Yeah, and you can be in pretty much any frame of mind you want to be in, you don't need alcohol to let loose. I find it a better idea to let loose but still have the option to reel it back in if it becomes necessary. Thank you and yeah it was. I don't talk about it much. The memories of what happened hurt to much. Binge drinking is a problem and a teenagers drinking is a problem, more definitely needs to be done. I enjoy a few drinks myself but I never get drunk (I did once when I was 17 - but that was 10 years ago now). I know how to control myself and I don't drink just for the sake of drinking, I like the taste as well, I even attend a few beer festivals. I usually drink lager or cider but I also like spirits and cream liqueurs. I also enjoy tasting local drinks when I am in other countries. Although I enjoy a few drinks, I don't need to drink to have a good time and have been out plenty of times and enjoyed myself without drinking. I know people who go out with the sole intention of getting drunk and I don't see the point of it at all, the risk you put to yourselves and others, and also the way you feel the following day... It just isn't worth it to me. I don't drink to get drunk but I don't mind enjoying 3 or 4 fingers of Bourbon (Whiskey if I have to but prefer Bourbon). Maybe a Caucasian once in a while. I also like me some beer. I'm with Dazza on this, minus the lager and cider. In fact as I type I've got a pint of Victory Ale next to me, well....half a pint now, but I drink alot, but not enough to lose control. I love the taste of a good beer and know my limits.